You are receiving this newsletter because you are logged in our Mailing List. A problem with reading this e-mail ? See on our Website. IMPORTANT DOCUMENTS - The program book "Benedict XVI and the traditionalists' (March 12, 2007) by Father Celier (SSPX), edited and prefaced by a Freemason∴ of the G∴L∴F∴. A Masonic scandal unprecedented summit of the priestly work of Archbishop Lefebvre. Given these frightening FACTS the question arises now: The SSPX would today be directed by an F∴M∴? And if that were the case, would date from when it enters into Lodge? Bishop Fellay at the choice either - by betraying Archbishop Lefebvre - it continues its policy Masonic described in the program book edited and prefaced by an F∴M∴, which would mark its public submission to the Lodge or He expelled Father Celier of the SSPX and revoke Father de Cacqueray for incompetence, because he covered his authority and sold himself this book Masonic. In the absence of any denial of Bishop Fellay, more than a month after the outbreak of the scandal without any reaction from him, we must admit that Father Celier, had for two years now, from Bishop Fellay and Father de Cacqueray, the order to go to France to present his book to all the priories, the clergy and the faithful the book wich is the program's alignment of the SSPX to Rome Masonic globalist apostate, a book edited and prefaced by a Freemason. * How is it possible that the Direction of the SSPX promotes and sells this Masonic? program book without any penalty? 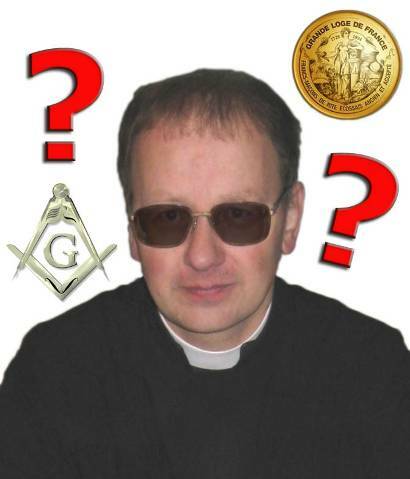 * How is it possible that Bishop Fellay imposes this Masonic∴ policy by terror? * Do you want our children to finish in the Lodge∴? DOSSIER IMPORTANT – Le livre-programme « Benoît XVI et les traditionalistes » (12 mars 2007) de l’abbé Celier (FSSPX), édité et préfacé par un franc-maçon de la G∴L∴F∴. Un scandale maçonnique sans précédent au sommet de l’œuvre sacerdotale de Mgr Lefebvre.